Is your dog vomiting? Should you be worried? What do you need to look out for? The following discussion from our Love That Pet vet will help you work out what to do. Part of the joy of pet ownership is having a loyal companion, but as owners, we are ultimately responsible for the health and well-being of our charges. And on many occasion, our dogs don’t make this easy. They are often very adventurous with what they will eat and will on many occasions eat some less than savory things on their walks. The following article aims to help you to determine whether your dog needs to immediately be rushed to the vet for vomiting, or whether a ‘wait and see’ approach can be taken, at least initially. Chronic vomiting is vomiting that persists longer than a few days. It may be episodic or intermittent in nature but it persists over a long duration of time. It is a frustrating condition for dogs and their owners due to a large number of disease states that can cause chronic vomiting. Vomiting is merely a symptom, not a disease in and of itself, therefore getting to the root of vomiting requires some diagnostic sleuthing on your veterinarian’s part. Chronic vomiting needs to be worked up by your regular veterinarian unlike bouts of acute vomiting which tend to be self-resolving. Acute vomiting can usually be managed by withholding water for 12 hours and food for 24 hours and then trying small amounts of a bland diet for 2 to 3 days such as boiled chicken and rice. Vomiting that persists for more than a couple of days should be worked up by your regular veterinarian as soon as possible for the best results. This is the first distinction to make and it is an important one. Knowing the difference between vomiting and regurgitation will provide your veterinarian with an essential clue for the diagnostic plan. It is very rare that a dog will vomit or regurgitate in the exam room where the vet can see it, therefore it is up to you to make the distinction when you observe your dog ill at home. Vomiting is the forceful ejection of stomach contents out from the mouth. It is usually foul-smelling, partially digested food with bile. Vomiting is typically preceded by retching and during vomiting the dog will hunch up and the abdominal muscles will contract. Regurgitation in contrast is seemingly effortless. There is virtually no retching and the regurgitated material tends to be undigested food compressed into a tubular shape. Regurgitation tends to signal esophageal disease such as megaesophagus whereas vomiting has many gastric and non-gastric causes. Simply knowing the distinction between vomiting and regurgitation can help your vet find a diagnosis quicker. After 24 hours if your dog is not vomiting, introduce a very bland diet such as boiled or steamed chicken breast and white rice (use a 50:50 ratio of white rice and lean, unflavoured cooked chicken). Feed small meals frequently. If your dog starts vomiting again, get him to the vet. If your dog is still vomiting despite fasting for 24 hours, see a vet. If the bland diet takes and your dog is still bright and happy, continue this diet for around 5 days, then gradually start introducing the normal diet again. The first day just feeds a few of your dog’s normal biscuits (or whatever he usually eats), then a few more the next day, so that over 7 days you are back onto his normal food. Fluid therapy may be necessary if there is dehydration present from the repeated vomiting. The rest of the treatment will depend upon what the underlying condition is. For example, antibiotics are used for small intestinal bacterial overgrowth and steroids are used for inflammatory bowel disease. Luckily veterinarians have a large arsenal of medications that target the gastric system such as anti-emetics that help decrease nausea and improve motility and H2-blockers that decrease acid production in the stomach. 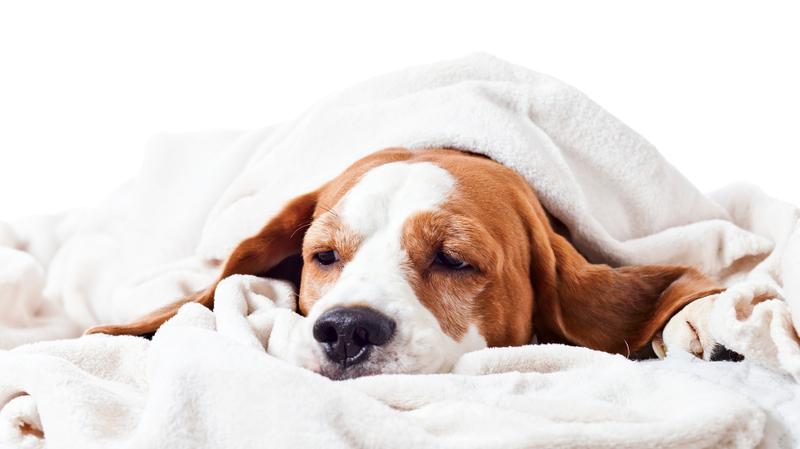 It is important as a dog owner not to ignore chronic vomiting as it usually signifies a serious problem. Please see your vet if your dog vomits repeatedly more than 2 or 3 days or if he has a habit of vomiting several times in a week.